Historical The Belokamens may have come from Irkutsk, Siberia. Bet Hatfutsot has a photo of a Belokamen family with the caption, “In 1916 Aaron Belokamen with his three brothers and their families left for Harbin in Manchuria.” There are gravestones for three Belokamens in the Harbin Huangshan Jewish Cemetery — Aaron (d. 1925), Abram (d. 1942) and Ester (d. 1937). Rosa and her husband may have living in Tianjin and Yokohama prior to her coming to HK. 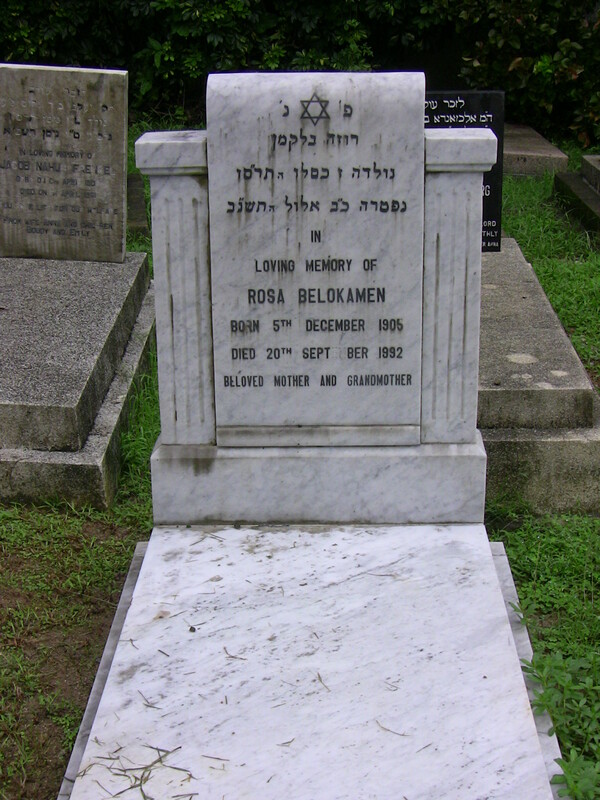 Zelig Belokamen (b. February 22, 1899; d. August 9, 1983) is buried in the Yokohama Foreign General Cemetery (Section 17, Area A, Side Right #4). He was the son of Aaron (mentioned above).